IF money were no object, I would buy this Christopher Kane rainbow dress to wear to all the upcoming music festivals this summer. Something about this dress seems conducive to dancing at an electronica concert, doesn’t it? The acid bright rainbow colors just screams 60s psychedelic nostalgia with a modern sensibility. Perfect for Electric Forest or Wakarusa, two festivals I hope to attend. 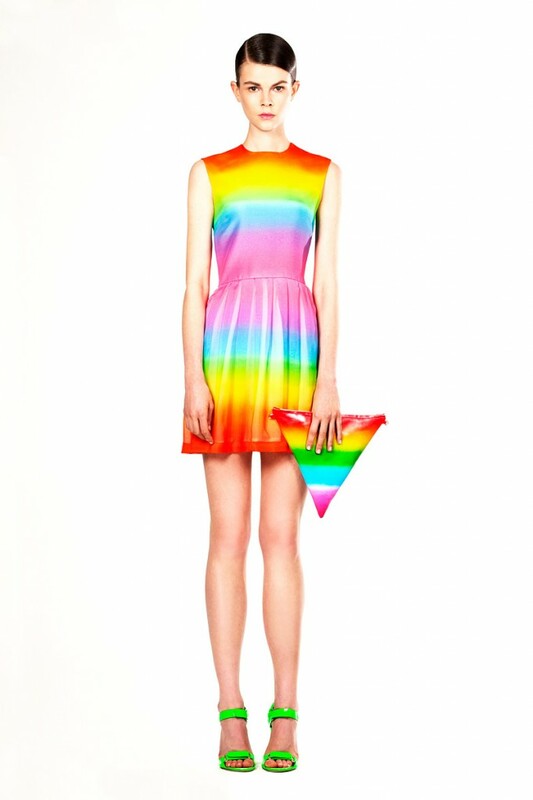 In my opinion the triangle clutch is a bit too obvious (we get it… it’s a triangle rainbow) but for a fashion-forward LGBTQ person this accessory would definitely be a powerful (and stylish) way to assert one’s identity. I see both 60s psychadelic and a bit of 70s retro (depending on how you style it). The endless possibilities! I’m in love with this dress, how can you not be? This would be so easy to make, get crafty! Stick to cotton and it would be hard to screw up.